Mala Mala Productions new SNG satellite truck in Madrid. the two it already has in Spain. Details of the three satellite trucks can be found on Mala Mala's TVZ page. 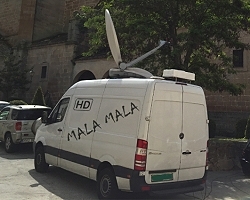 In addition to mobile uplink facilities, Mala Mala has a live broadcast, multi-camera studio in Madrid. It also has camera crews that can be deployed throughout Spain to cover news and sports events.